The Pew Research Center asked Americans who they thought did the best job as president in their lifetime. The top pick: former President Barack Obama. Obama was the choice of 44 percent of the respondents in the poll, which was published Wednesday. Bill Clinton came in second with 33 percent and Ronald Reagan was third with 32 percent. 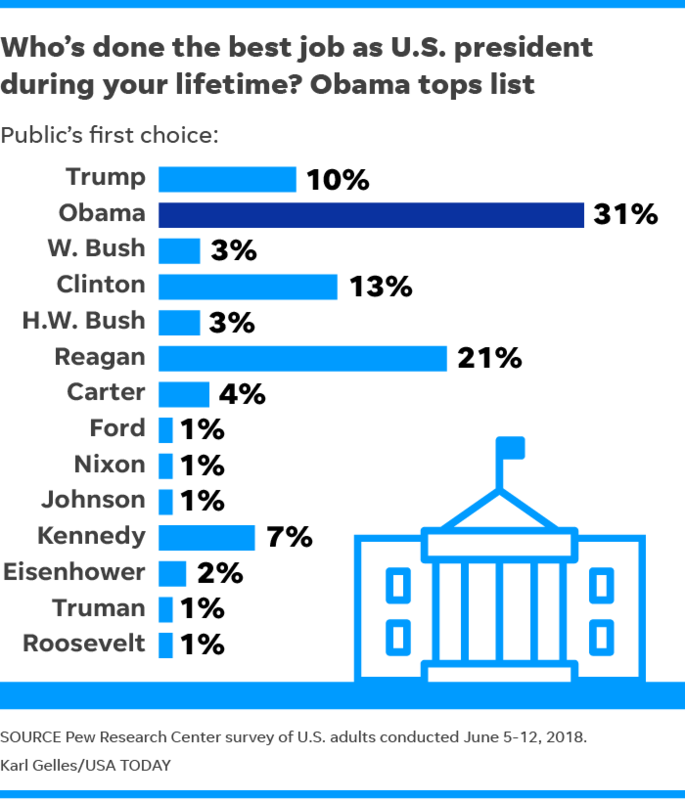 Although not yet even halfway through his first term, President Donald Trump got 19 percent to place him in fourth place, ahead of both Bushes, John F. Kennedy and Franklin Delano Roosevelt. According to Pew, Obama got 20 percent at about the same point in his presidency. The survey was conducted from June 5-12 and 2,002 people were asked to give both their first and second choices. It has an error margin of 2.6 points. Obviously, when someone lived is key to who they think was the best president of their lifetime. For example, of those who were alive during the Kennedy administration, about a quarter chose JFK. Unsurprisingly, party identification was very closely tied to a person's answer. Obama was the first or second pick of 71 percent of Democrats but only 13 percent of Republicans. Obama joins fellow former presidents Jimmy Carter, George H.W. Bush, George W. Bush and Bill Clinton to address the audience during a hurricane relief concert at Texas A&M University on Oct. 21, 2017, in College Station, Texas. Obama delivers a speech with Democratic gubernatorial candidate Ralph Northam during a rally in Richmond, Va., on Oct. 19, 2017. Obama stands on stage with Democratic candidate Phil Murphy, who is running against Republican Lt. Gov. Kim Guadagno for the governor of New Jersey, on Oct. 19, 2017, in Newark, N.J.
Argentinian President Mauricio Macri speaks with Obama during their meeting in Bella Vista, Argentina, on Oct. 7, 2017. Obama delivers a speech during the Green Economy Summit in Argentina on Oct. 6, 2017. Obama and Prince Harry watch wheelchair basketball at the Invictus Games in Toronto on Sept. 29, 2017. Obama meets competitors from Team USA on day 7 of the Invictus Games 2017 on Sept. 29, 2017, in Toronto. Former presidents Bill Clinton, George W. Bush and Obama pose with a group of golfers' wives and girlfriends during opening ceremonies for the 2017 Presidents Cup at Liberty National Golf Club in Jersey City, N.J., on Sept. 28, 2017. Obama speaks at Goalkeepers 2017 on Sept. 20, 2017, in New York City. In this July 3, 2017, photo provided by Jolene Jackinsky, Obama holds Jackinsky's 6-month-old baby girl while posing for a selfie with the pair at a waiting area at Anchorage International Airport, in Anchorage, Alaska. Obama gives a speech during the 4th Congress of the Indonesian Diaspora in Jakarta, Indonesia, on July 1, 2017. This handout picture released by the Indonesian Presidential Palace on June 30, 2017, shows Indonesian President Joko Widodo chatting with Obama on the lawn of the presidential palace in Bogor. Obama waves to reporters as he walks with Indonesian President Joko Widodo, left, upon arrival for their meeting at the Bogor Presidential Palace in Bogor, West Java, Indonesia, on June 30, 2017. Obama walks with his daughter Malia, left, during his visit to Prambanan Temple in Yogyakarta, Indonesia, on June 29, 2017. Obama and his family raft at the Ayung River during a family holiday in Bali, Indonesia, on June 26, 2017. Obama speaks at the convention center in Montreal, Quebec, on June 6, 2017. Obama and German Chancellor Angela Merkel arrive for a discussion on democracy at Church Congress on May 25, 2017, in Berlin, Germany. Obama waves before he is awarded the German Media Prize in Baden-Baden, Germany, on May 25, 2017. Obama speaks with Sam Kass, food entrepreneur and former White House chef, during the third edition of "Seed & Chips: The Global Food Innovation Summit," focusing on new technologies for feeding the globe, in Milan on May 9, 2017. Obama is presented with the 2017 John F. Kennedy Profile In Courage Award by Caroline Kennedy at the John F. Kennedy Library in Boston on May 7, 2017. Obama speaks at a community event on the Presidential Center at the South Shore Cultural Center on May 3, 2017, in Chicago. The Obama Foundation unveiled plans for the former president's lakefront presidential center, showcasing renderings and a model. Obama and former attorney general Eric Holder leave the funeral mass for longtime Pittsburgh Steelers chairman, Pro Football Hall of Famer and former U.S. ambassador to Ireland Dan Rooney on April 18, 2017. Obama, accompanied by former first lady Michelle Obama, waves as they leave the National Gallery of Art in Washington on March 5, 2017. Obama vacations off the coast of Moskito Island in the British Virgin Islands in on Feb. 7, 2017. Obama is pictured with British billionaire Richard Branson off the coast of Moskito Island in the British Virgin Islands on Feb. 7, 2017. Obama waves as he boards a Marine helicopter during a departure ceremony on the East Front of the U.S. Capitol after President Trump's inauguration on Jan. 20, 2017.